As we have moved to an era where eCommerce website like Marketplace websites and hyperlocal websites have put down a strong foot in the market. These websites have paved the way for the local sellers/vendors to add their products. But many local sellers with limited shipping range cannot provide international shipping to the customer. To avoid such a scenario, there is a need to restrict delivery for the seller within a particular range. With Marketplace Delivery Restriction extension, the seller can define the area or the region in which the product delivery for the respective seller can be made feasible. Opencart Marketplace Delivery Restriction module is an add-on. To use this module, you must have installed the Opencart Marketplace module first. Why is Delivery Restriction needed for your Marketplace website? In a Marketplace website, where there are numerous sellers located in different locations around the globe. It becomes difficult for the seller to manage the shipping as products can be ordered from anywhere in the world. It can be a little tricky as there may encounter instances where the cost for the shipping of the product may even go higher than the product cost. Consider an example for the detailed understanding if you have purchased a product that cost you 10 USD. But the shipping to the respective address may cost equivalent or even higher if the distance between the pickup and the drop off location is far from each other. This will make it little uneasy for the seller to deliver it. There may also be cases in which the customer orders from a remote location where the shipping provided by the seller is unavailable. You can avoid such scenarios with this module as it allows the sellers can add the shipping zones based on country, state, and zip code. With this module, the seller will be able to restrict the shipping accessibility to a certain span. Under which the seller can easily and swiftly provide the shipping of their products. This will not only increases the customer accountability in the market but will also improve its efficiency and market grip of the seller. Many concepts like the Hyperlocal marketplace have flourished due to the single reason that they are majorly focused on faster delivery. The zones can be uploaded in various ways like one shipping zone at a time or in a single go through CSV, XML, XLS file format. If the customer is not in the validated shipping zones, then an error message will be displayed restricting the customer to add the product to “Add To Cart“. 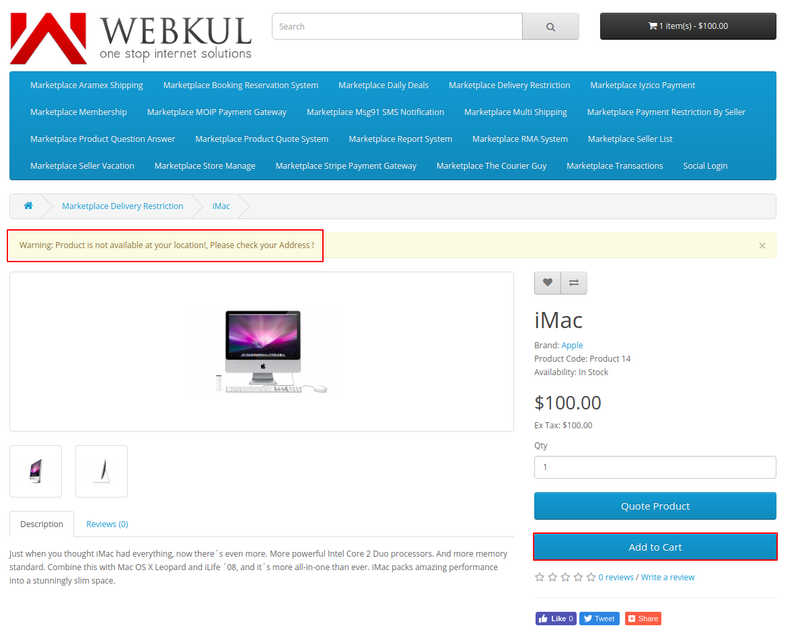 If you have any issue or requirement, please feel free to share us at support@webkul.com.